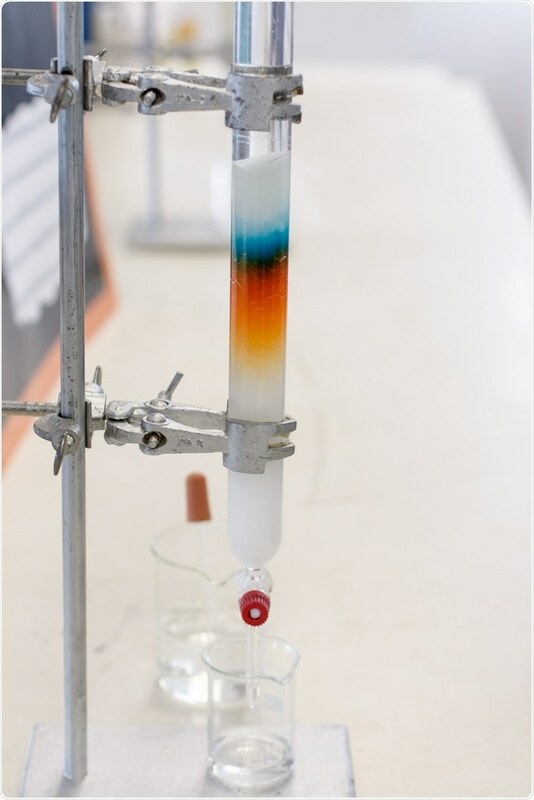 Chiral column chromatography makes use of the concept of chirality. Chirality relates to study of the three-dimensional structure of molecules. The term comes from the Greek root chir-, hand, and means “handedness.” Chiral molecules show a left- and right-handed nature. They exist as mirror image forms that cannot be made to overlap byrotation. Molecules showing chirality rotate the plane of polarized light. The degree of rotation is called specific rotation or optical rotation. The two mirror image forms of a chiral compound are called enantiomers. Those that rotate the plane of polarized light to the right are called (+) or dextrorotatory forms; those that rotate to the left are called (-) or laevo rotatory. Racemic mixtures are those that have both enantiomers in equal proportion. They do not rotate polarized light, as the enantiomeric effects cancel out each other. A majority of bioorganic molecules (amino acids, proteins, sugars, nucleic acids) are chiral, and in nature they exist in only one of two possible enantiomeric forms. The absorption, metabolism, and excretion of enantiomers have been found to be different in animal and human studies. The implication of this is that living organisms show preferential positive responses to one of a pair of enantiomers in drugs and agrochemicals. The human body is so selective in its responses to chiral compounds that one isomer may produce a desired effect, while the other may be ineffective, and sometimes even toxic, so it is necessary to separate enantiomers in the pharmaceutical and agrochemical industries. Other reasons for separation include lower dosing requirements, non-interference by the undesirable enantiomer, and cost and time savings. Enantiomer separation from numerous compound groups, including nonsteroidal anti-inflammatory drugs (NSAIDs), agricultural compounds, natural products, β-blockers, and pharmaceutical drugs, have been achieved through chiral column chromatography. There are two approaches to the separation of chiral compounds by column chromatography. One is to use a chiral additive to the mobile phase, and the other is to use a chiral stationary phase (CSP). Either way, the enantiomers are introduced into an asymmetric environment, and this gives rise to two diasteriomeric compounds with different physicochemical profiles, which in turn is used for physical separation of the individual enantiomer either by high-pressure liquid chromatography (HPLC) or gas chromatography (GC). Of the two possibilities, use of the chiral stationary phase is more common. The chiral stationary phase is prepared by binding of a chiral selector with a support material, usually silica. Transient diasteriomeric complexes with different stabilities are formed between the enantiomers and the bound chiral selector, which is then used for their separation. To date over a hundred chiral stationary phases have been developed and made commercially available. However, none of these can be considered universal for all the groups of racemic compounds. Choosing the right CSP for the separation of a specific pair of enantiomers is often difficult. One method is to choose the CSP based on predictive rules developed for empirical structures. This can be complemented with knowledge of the chemistry of the racemic mixture and the CSP. Reactions of the mobile phase with the solutes and the CSP may add to the complications, so interactions between all three components must be considered. The key is knowing the possible chiral recognition mechanisms involved in the entire process. As CSPs are relatively expensive, chiral mobile phase additives (CMPA) are an attractive alternative. In this technique, the additives dissolved in the mobile phase form transient complexes with the solutes. The forces that guide the separation include differences in the formation kinetics and relative stabilities, as well differences in their partitioning between the mobile and the stationary phases. However, other factors such as concentration of the additives, pH, and temperature of the mobile phase will have to be carefully considered for successful separation of enantiomers. Common CMPAs include camphorsulphonic acid, ligand exchangers, macrocyclic antibiotics, and cyclodextrins.